Pipeburn Poll: Full-Face, Open Face, Or None At All? I’ve always held a fascination for America’s ability to put personal freedoms above all else. There’s few other examples of the culture that take you so quickly to the heart of the country and which speak more strongly about what it means to be an American. And in my eyes at least, nothing speaks more strongly about America’s dedication to personal freedoms than their helmet laws. Now please don’t get me wrong, I’m no spokesperson for the Helmet Law Defense League. I have never ridden a bike without a helmet and I never intend to. I value my brain too much for that. It’s what I use to love my family, earn a living, and enjoy a country ride in autumn as the sun sets. But I’ve always been one for standing up for a person’s right to choose. Of course, it’s not as easy as all that. It’s impossible to deny that helmets reduce fatalities and brain injuries amongst the biking community, and that in turn reduces insurance premiums and medical costs for us all. And losing your ability to wipe your own arse and support your family because some drunk pensioner crushed your head like an egg is a pretty poor trade-off for the feeling of the wind in your hair. Yet American still has four states that are totally fine with their population of millions riding without helmets. So what’s your choice? When you open the garage door in the morning and walk towards your miraculous iron horse are you carrying a closed helmet, an open one, or just a fist full of nothing? 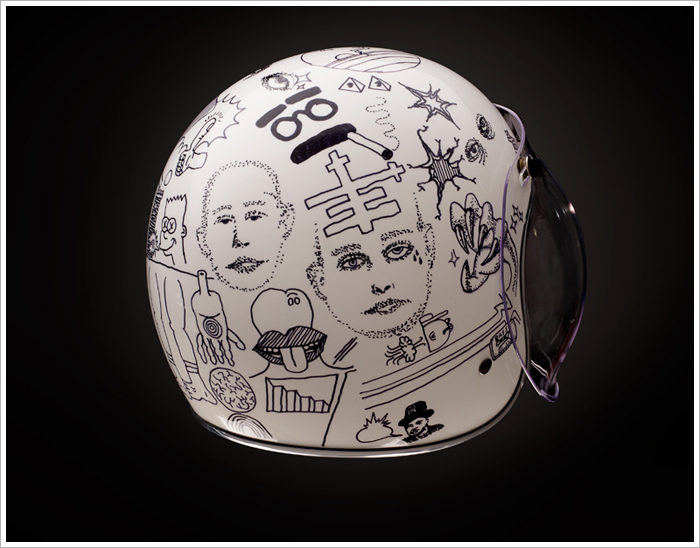 Back in 1954 Bell founder Roy Richter formed his first helmet out of fiberglass and named it the “500”. That humble helmet was to change the entire modern motorsport helmet industry. 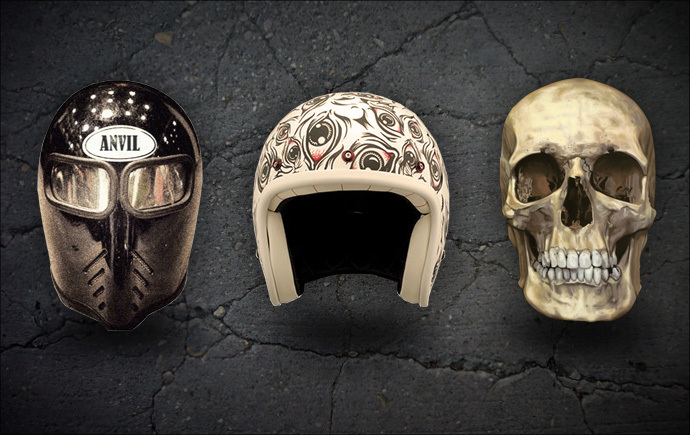 Bell’s 2010 Custom 500 range pays homage to these original classics, although luckily now they are designed with loads more protective technology. 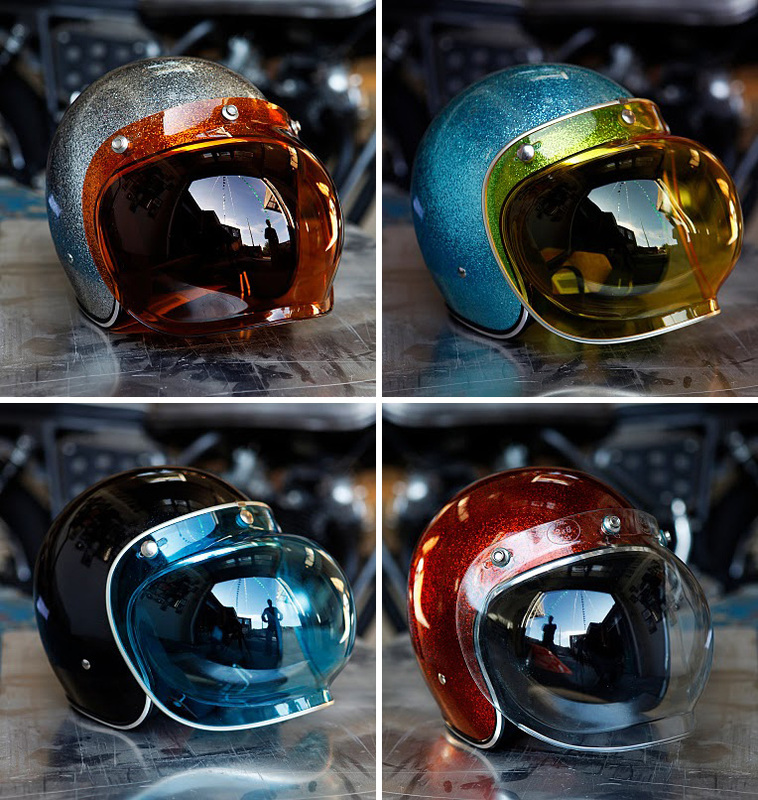 The ‘500’ range are some of the coolest lids we have seen since the Steve McQueen replica that Bell released last year, and unlike the Biltwell helmets these are DOT-compliant. Most of the designs are limited editions and can be purchased through The Bell Store which post worldwide. The ‘Bloodshot Eye’ design in particular looks like it was inspired by legendary skateboard and rock poster artist Jim Phillips. Check out his amazing range of work if you appreciate this style of illustration.